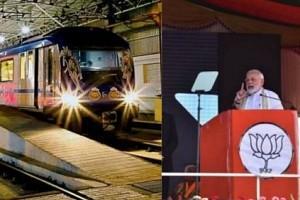 Prime Minister Narendra Modi launched the last stretch of Phase I of the 45-km Chennai Metro network on Sunday. The last stretch is 9km long connecting AG-DMS with Washermanpet. The rest of the stretches were launched from 2015 in six phases. The last stretch was launched by Modi via video conference from Tirupur. TN Chief Minister Edappadi K Palaniswami and Deputy Chief Minister O Panneerselvam were present during the inauguration. Union Minister for Urban Affairs Hardeep Singh Puri, Industries Minister M C Sampath and Fisheries Minister D Jayakumar flagged off the train from Chennai Central Metro station. PM Modi also announced a modernisation project for the Chennai International Airport, (Phase-II), a new integrated terminal building at Trichy airport and a 100-bedded ESI hospital in Tirupur.